Nothing says back to school like a fresh, new pencil. The Promotional Classic Pencil is a great inexpensive option when you need a large quantity of giveaways. Consider handing them out at orientation or including them in a small gift bundle for students! The Foldable Lunch Sack makes for a handy gift, whether you’re giving to grade school students or university students. On a busy school day, there’s nothing they’ll appreciate more than good snacks and an insulated lunch sack that makes carrying those snacks extra convenient! With a vivid color selection, you’re sure to create a striking backdrop for your logo or match your school colors! Starting off organized and prepared is key to every back to school season. This notebook takes preparation to the next level with a surprise 4000mAh power bank inside, perfect for charging your phone or other small electronics. Trust us when we say this will be a must-have for every high school or university student! One of the most exciting aspects of back to school is the start of fall sports! Whether your students are athletes or prefer to cheer on their friends from the sidelines, up their school spirit with a drawstring backpack or a rally towel complete with the school mascot or logo. The Wave Drawstring Backpack is a stylish and useful bag for storing athletic wear that makes a perfect gift for athletes, while the Rally Towel is a fun gift to giveaway to the crowd at the start of a sporting event! 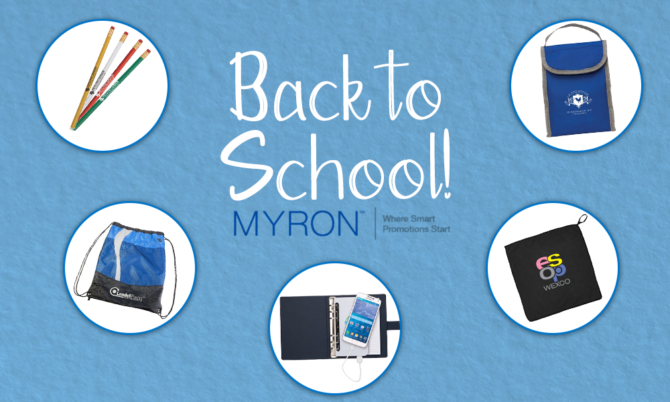 Make sure your promotional products get straight A’s this back to school season by ordering from Myron. With a massive selection of customizable products from notebooks to apparel and a 100% satisfaction guarantee, Myron is the place for all of your academic promotional needs.